AOPA Vice President of Airports and State Affairs Greg Pecoraro, Vice President of Regulatory Affairs Rob Hackman, and Manager of Airport Policy John Collins conducted an aviation town hall meeting at the Maryland Regional Festival of Flight. Pilots around the country are affected by efforts to promote flight safety, protect airports, defend against costly proposals, and build aviation communities. On May 4 and 5, AOPA staff discussed national issues and their local implications with an audience close to home. 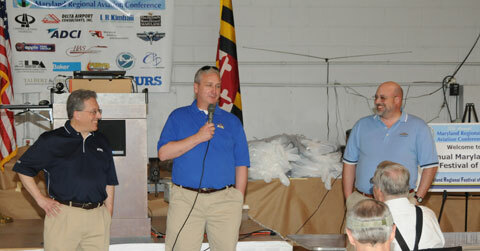 The Maryland Regional Aviation Conference and Maryland Regional Festival of Flight—both held at Hagerstown Regional Airport, a 15-minute flight from AOPA headquarters in Frederick, Md.—offered educational and social opportunities to area pilots, airport managers, and members of the local community. AOPA staff discussed present advocacy efforts and issues of general aviation safety. AOPA Vice President of Airports and State Affairs Greg Pecoraro delivered the keynote address for the Maryland Regional Aviation Conference, the annual meeting of the Maryland Airport Managers Association and FAA regional staff, on May 4, speaking about a broad range of AOPA’s advocacy activities at the national and local levels. An effort to prevent Maryland from enacting a luxury tax on the sale of GA aircraft is among the association’s recent battles. Airport managers often connect with AOPA members on a local level; Pecoraro thanked them for supporting the association’s Airport Support Network program and encouraged them to support AOPA’s efforts to build airport communities. A larger contingent of AOPA staff returned to the airport the following day for the Maryland Regional Festival of Flight, hosted by the FAA Safety Team and Hagerstown Aircraft Services. Pecoraro, AOPA Vice President of Regulatory Affairs Rob Hackman, and AOPA Manager of Airport Policy John Collins conducted an aviation town hall meeting, fielding questions on topics ranging from the AOPA/EAA medical exemption request to the prospects for federal aviation user fees. The Air Safety Institute’s David Kenny joined panelists from the Experimental Aircraft Association, the insurance industry, the FAA Eastern Region, and the FAASTeam to discuss safety during flight testing of amateur-built experimental aircraft. Panelists encouraged close attention to resources such as FAA Advisory Circular 90-89A and EAA’s series of articles on test-flying procedures for this important period. “Conventional wisdom holds that initial flight tests represent a period of greatly increased risk, and both insurance claims and NTSB accident reports support that view; in 2010, more than 10 percent of all accidents in homebuilt aircraft occurred during their first 20 hours of operation,” Kenny later explained. Reasons included physical deficiencies in the aircraft, inadequate transition training, or lack of recent flight experience.